Almost a teahouse but mostly a cafe, Little Matcha Girl serves up matcha, coffee and cake. It also pays a little homepage to the Hans Christian Anderson story the Little Match Girl. It is no secret that I adore matcha (and on various occasions I have even added matcha powder to my pancake mixes). Its flavour is complex in that it is bitter but maintains a sweet aftertaste while remaining astringent. Matcha is incredibly versatile and can be incorporated in food or drink. In this case, Little Matcha Girl does both. 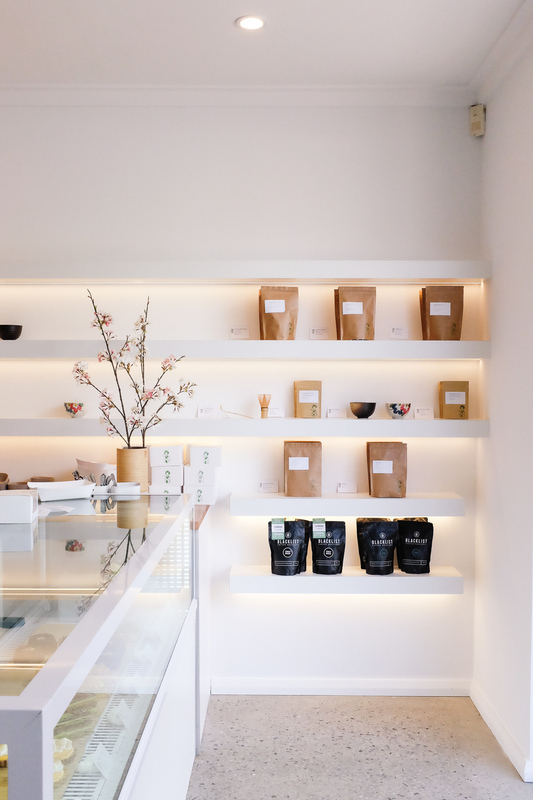 Opened by Stefanie and Darren, whom some of you may be familiar with from Sprolo, Little Matcha Girl is located on Preston Street in beautiful Como. The space is open, understated and beautiful, reflecting aesthetic qualities of shibumi (渋み), while simple and clutter free, much like kanso (簡素). It is simplistic and its focus very much on the service, drinks and food. Freshly baked pastries welcome you in rows near the entrance. Signature Japanese flavours present themselves in the pretty cabinet by the front, where Matcha Opera Bars, Black Sesame Cakes, Matcha Eclairs and Strawberry Shortcakes fight for your attention among seasonal items like Orange-Yuzu Tarts and White Peach Financiers. The pastries on offer are reflective of Japanese flavours, complemented by French culinary techniques. Somehow I managed to sample all of the items on offer. This can be accredited to Tash's excitement, Sarah and Matthew's inability to say no to good food or drink, and our biological make up of having eyes bigger than our stomachs. Going with Htet's recommendation, we tried the Strawberry Shortcake. It appeared dense however was light and soft, the strawberry curd providing classic sweetness and a subtle tartness. It was a nice twist on the typical Japanese Strawberry Shortcake with cream and strawberries sandwiched between two pieces of sponge. The Green Tea Opera Bar reminded me a little of Sadaharu Aoki's Matcha Azuki layer cake. The dark chocolate ganache broke up the many layers of green tea but complemented the green tea butter cream. Although still very mooreish, I found it was missing something that gave it a little crunch and texture, (perhaps I am swayed by Sadaharu Aoki's with his matcha macaron topping). Nevertheless, given it was a matcha rendition of the standard Opera Cake, it ticked all the boxes of a smooth butter cream, rich chocolate ganache and light sponge ayers. It was a nice slice that was not overpowering or too sweet. I could easily order another with a hot cup of gokou tea. The matcha latte ($4.50 Small, $5.50 Large) is smooth, providing a classic sweetness and a matcha flavour that refrains from being overbearing or rich. Revealing a little genmaicha influence, the matcha latte is topped with brown rice. The nuttiness and semi-soft crunchy texture of the rice adds a subtle twist on the typical matcha latte. It proves to be one of the best matcha lattes I have had. 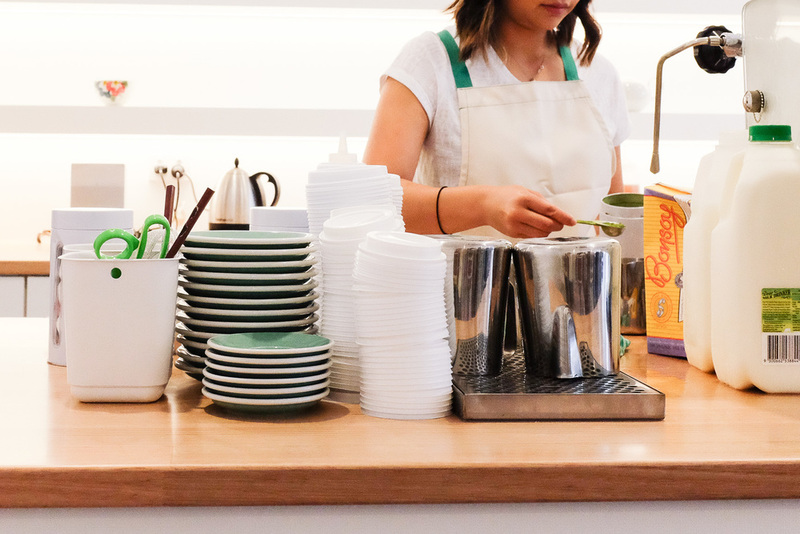 Little Matcha Girl is not only for matcha lovers, as they have partnered with Blacklist Coffee Roasters (a specialty coffee roaster) and offer single origin and milk blends to coffee lovers. You may decide to delight yourself with a single origin matcha tea ceremony (gokou and hikari) or sencha, hojicha or genmaicha. Or, if you'd much rather to eat hojicha in some form, you've got the option in the Chocolate Hojicha Profiterole, which once you crack your fork through the crunchy and crispy exterior, will reveal a bubble of chocolate and hojicha tea cremeux. If you're a complete yuzu nut like myself and Tash, don't look past the Orange-Yuzu Tart with its crumbling, melt-in-your-mouth shortcrust pastry and tangy, fresh unique yuzu flavour that can still be tasted through the orange notes. The Black Sesame Cake may look a little strange but the chiffon sponge is light and airy and what we thought would have tasted a bit flat, turned out to be one of the favourites of the day. The lemon curd was offset by the black sesame cake that held it. The sesame also seeds added just the right amount of crunch to an almost barely there mouthful of cake. The Green Tea Eclair was more on the sweet side but easily scoffed down in four simple bites, but was a little hard to crack through. The White Peach Financier was soft but held its form when a fork ran through it. As the peaches were poached in sencha and offered a fresh option. The team are friendly, conversational and focused on delivering the best service with their food and drink. Much like the properties of green tea, Little Matcha Girl is a place to slow down, enjoy and escape the hustle of outside. Grab yourself a number written in kanji and enjoy an Opera Bar with a small, intimate group of friends.